Ryota Nonomiya (Masaharu Fukuyama) is a determined Japanese business executive. He humbly avoids the spotlight, instead allowing his incomparable work ethic and determination to take the spotlight. He is irreplaceable professionally, but his marital life is in turmoil and he suffers failing relationships with his wife Midori (Machiko Ono) and son Keita (Keita Nonomiya). Ryota despises messy situations, so when he returns home to news of a phone call from the local hospital where their son was born, his only request is that developments won’t be messy. After extensive tests, Ryota and his wife learn that their son Keita was switched with another boy at birth. Ryota shelves his instinct to find out who and what is behind this mistake, and meets with the Saiki’s (Rirî Furankî and Yôko Makiwho), the people who have been raising Ryusei Saiki (Shôgen Hwang), Ryota’s son by blood. Devastated and determined to come up with a plan to ‘exchange’ the boys swiftly and without much emotional damage, the families agree to start switching the boys on weekends, gradually acclimatizing them to each of their new home environments. Although the film is set with the anticipation that the lives of both sets of parents would be showcased, Like Father, Like Son sets its sights on the Nonomiya family, focusing on Ryota; a professional who is driving his family up the class ladder in a socially driven Japan. 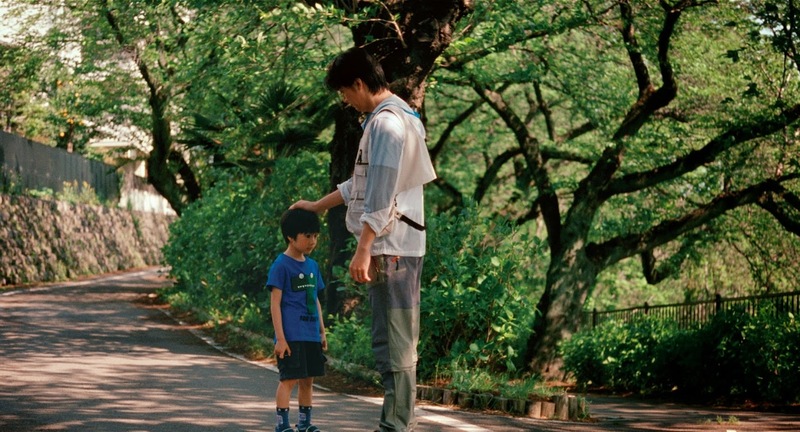 Koreeda takes you through the different struggles of accepting the truth. At first, the Nonomiyas struggle with the reality of raising a son that is not their own. They then contemplate how they could fail to notice different physical features between father and son, suffering the cruelty of those who did notice. Ryota is the main focus of Koreeda’s scrutinizing observation while his wife Midori is left at the wayside. Koreeda seems fascinated by the idea of such a powerful and determined man grappling with such a rare, indescribable situation where no obvious victory is clear. Perhaps Koreeda sees a lot of himself in Ryota; the story is supposedly set around recent real-life events, although, the specifications of these factual events are never brought into the spotlight. For most of the movie, Ryota tries to fix his problems with his power, status and wealth. He immediately enlists the help of his old roommate, a powerful lawyer who wants to diffuse the situation as quickly and painlessly as possible, without ever providing Ryota with any emotional or paternal comfort. Like almost everyone in the Nonomiya family, Ryota must face the situation alone. Once Ryota takes the reigns on figuring out how to handle the situation, he finds that real power lies in his ability to connect with his family and disconnect from his professional life. As stern and composed as Ryota remains, he reveals himself to the audience as the most cowardly in the film by always looking to his professional life as a distraction from the conflicts in his personal life. In the first meeting between the parents, Koreeda introduces us to a blend of very bizarre comic relief, for a very morbid concept of grief. The majority of the comedy comes from the other father, Yudai (Furankî), an appliance repair man whose mantra in life is in stark contrast to Ryota. Yudai would rather put off a task until tomorrow. His initial idea to exchange the children as if they were simply pets, sets up a very optimistic man, but also a very flawed character. Yudai is anything but an absent father, spending most of his days making minimal sales at his shop (which also serves as the Saiki’s home), and fixing battery powered toys or flying kites with his children. Yudai is the man Ryota never wants to be, while also showing us the man Ryota never could be. Aside from their ambitions, the two families also differ greatly socially and economically. While the obviously lower classed family take baths together and spends their days playing together, the other family lives in an apartment that resembles a high class hotel. These little but quite obvious social differences also exhibits the film’s implicit question of nature versus nurture. It allows audiences to question whether the social classes of the families should matter, especially when talking about Keita going to the Saiki’s home. These small differences in their upbringing are never highlighted, but are always left lingering in the back of your mind. One of the biggest ironies throughout the film is that there was no better setting to place this story than Japan. The Japanese culture is deeply rooted in a very respectful and dutiful honour code which allows both sets of families to try to get through this situation while maintaining a respect for their parenting skills and the offerings to each of their children. As it so clearly states, one father is surely able to provide a son with a more stable future within the highest social class. The other father, content with just living in a certain state of happiness, marvels at his ability to spend as much time with his family as possible, while earning just enough to survive. These models of fatherhood are surely crafted; a model of a father who provides for his family financially yet lacks any sort of emotional depth, against a father who lacks any skills as a provider but who is never absent from their lives and offers stimulation that goes well beyond any form of material need. When the Nonomiya family begins to accept Ryusei into their home, it is the most time Ryota spends with any child, including his time raising Keita. But, as his moments of bonding start allowing for guilt and memories of Keita to flow into his heart, the audience comes to the clear conclusion that Ryota is essentially exchanging one child that he does not know for another. It’s all in the blood, and thankfully for Koreeda’s Like Father, Like Son, the blood that runs through the body of work is one that keeps the authenticity of Japanese culture intact. I am sure that this film, like one of my all-time favourites Oldboy, a South Korean film that at first viewing had difficulty connecting with me in terms of the customs and cultures of its people, will have a very challenging time grabbing a Western audience’s emotional and sentimental triggers. But like anything else foreign that makes a splash on the festival circuit, look for a Hollywood remake of the film coming to theaters by way of Steven Spielberg and his production company DreamWorks Studios in the near future. It will surely inject endless melodrama, an emotionally manipulative score by John Williams and tremendous need for tissues. Before the two sets of families figure out how to handle the situation without inflicting much damage on the children, Ryota seems to notice that no matter how much you try, you may never be able to change someone’s ways and teach them the simple things. Like Father, Like Son foreshadows early what lies ahead and the choices all the characters will make for a happy future. Being a daddy is easy; fathering a child into a man is the challenge. Regardless of the father, the son or the family, this film unequivocally challenges the definition of happiness and the notion of living in a house, but wanting to create a home. Like Father, Like Son is sure to find a sentimental home in your hearts. Is Like Father, Like Son a hopeful fable of promise, love and human adversity? Or does the film fall flat on its face off the monkey bars? Do foreign films succeed in having a very noticeable foreign identity or need a Hollywood remake treatment? What were your thoughts with the final ending of the film? Leave your ideas and comments below. Check out the trailer for Like Father, Like Son here. You share interesting things here. Glad to read them.